The population of Melbourne will surely be breathing a sigh of relief with the announcement today by Lord Mayor Robert Doyle that Swanston Street will become a car-free zone by 2012. Doyle, who has part of his mayoral campaign for election was pushing for bringing cars back to Swanston Street, has obviously bowed to the pressure of his fellow councillors on his remarkable about face even being a spokesperson for the latest proposal. Cr Doyle said the council did not want people driving into the city. 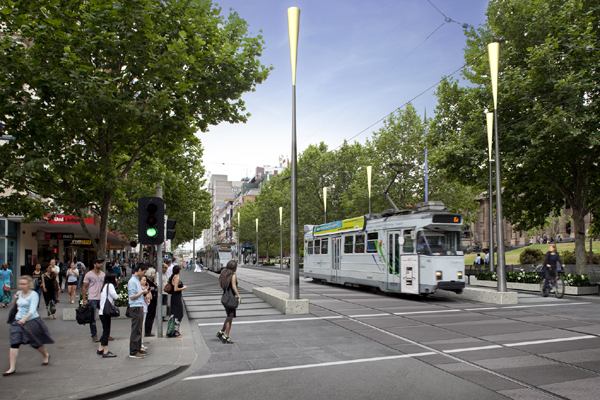 The $25.6m proposal includes four new “city square” type developments at tram superstops on Swanston Street and improved cycling access. It is certainly a pleasing outcome for all and it will be interesting to see how it all pans out. Who says an old dog can’t learn new tricks.